You may already know her as the heavily inked, bombshell mixologist at Japp’s – re-energizing Over-the-Rhine with every stir, shake and pour. But Molly Wellmann is more than a local celebrity … and she’s way more than tattoos and ‘tude. 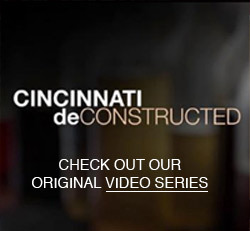 Get to know her here, in the pilot episode of Cincinnati Deconstructed – filmed and directed by Michael Holder and written and produced by yours truly. Our intention is to give you an intimate, behind-the-scenes peek inside the unique personalities that define the food and drink scene here in Cincinnati. We hope you’ll come along with us for the ride. If you like what you see, please make sure to let us know by commenting, tweeting and/or posting on Facebook! Your feedback is really important to us – and will go a long way in determining how many of these we’re able to make in the future. Thanks everybody – and cheers to Molly Wellmann – we’re so lucky to have her here in our city. Bravo you two!! Fascinating insight into an intriguing personality and beautiful videography. Well done and thank you for the experience! Holy crap. That’s freakin cool! Thanks guys – I was so afraid people wouldn’t watch! Good stuff. Keep bringing Over-the-Rhine back. Great job! Really fun and interesting! Looking forward to more in the series! Love it! Please keep it up, but please don’t exclude NKY. Matt Buschle of Virgils’s comes to mind. Wow! Stunning video of my favorite lady in Cincinnati. Looking forward to more of these so I can share with friends. Really glad you enjoyed it – I’m so lucky to partner with the very talented Michael Holder on this. Our pilot project with Molly has been getting great feedback – we’re excited to keep this going. How many cameras did you guys use when you filmed this segment? Great segment. EXCITED for the new bourbon bar in KY!